Millennials Saving the Christmas Tree Industry? 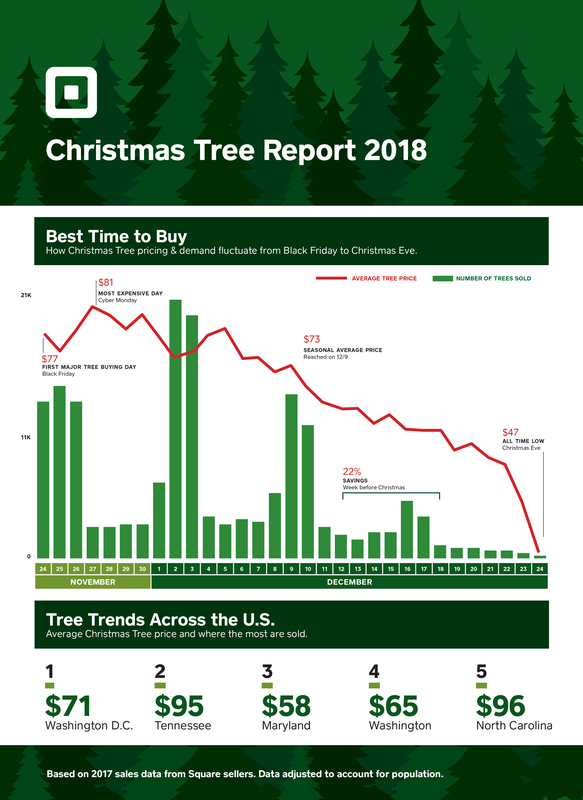 Square, Inc. in partnership with the National Christmas Tree Association released a data report analyzing Square sales from thousands of Christmas tree farmers and sellers across the country. The findings reveal price fluctuations throughout the holiday season, giving consumers a guide to selecting the best day to buy their tree. According to Square sales data, the report shows that Christmas tree prices increased 17% from 2015 to 2017, with the average price rising from $64 to $73. Industry experts from the National Christmas Tree Association estimate prices will hold steady this year, with plenty of trees to go around and that every consumer who wants a real tree will be able to buy one. For those headed to the farm, local charity lot, or retailer, Square data shows the Christmas tree buying season kicks into high gear on Black Friday with average price of $77, and prices spike on Cyber Monday, reaching $81. For those looking for a deal, holding out until the week before Christmas could save you about 22%. Prices for procrastinators hit an all time low on Christmas Eve at $47. This season marks the sign of an early renaissance for Christmas tree farmers thanks to environmentally conscious millennials who are opting to buy natural, locally grown trees, according to the National Christmas Tree Association. Demand previously dipped when baby boomers turned to fake trees as their kids moved out of the house. Christmas trees are now part of millennials’ hyper-awareness and affinity for all-natural and locally sourced food, beauty products, home goods, and more. Local growers say they are also embracing millennial customers seeking out the perfect social media moment choosing or cutting down a tree.